His curiosity was sparked by unusual shading by his home in Sorbolo, Parma. He contacted local archaeologists who investigated and confirmed it was once the location of a Roman villa. The satellite images threw up a dark oval shape more than 500m (1,640ft) long, as well as shaded rectangular shapes nearby. Mr Mori decided to alert experts from the National Archaeological Museum in Parma about his find. After excavating some ceramic pieces from the site - now farmland - they confirmed a Roman villa once stood there. "At first they thought the site might be Bronze Age but a closer inspection turned up ceramic and stone pieces that showed it was a Roman villa built some time just before the birth of Christ," he was quoted as saying in the UK's Daily Telegraph newspaper. 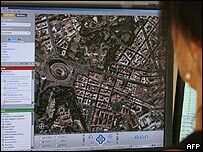 Google Earth is a service offered by the US-based internet search engine Google, allowing users to view most parts of the world using a combination of satellite imagery and maps.